Mt. Kuju is a group of volcanoes of more than 1500m high located at the center of Oita prefecture. The principal peaks are Mt. Kuju (1791m), the highest point in Kyushu Island, Mt. Daisen, Mt. Mimata etc. It is a well known tourist resort because of bunches of alpine plants, camping and hot springs, and belongs to Aso Kuju National Park. Yamanami Highway passes through. NB: Be aware! The group of volcanic peaks and the highest peak among them are both called Mt. Kuji but written differently. Mt. Mimata which shows a balanced and imposing aspect is a beautiful mountain: it has this name because of its 3 divided peaks. Sugamori Pass is located between there and Mt. Iwo. Mt. 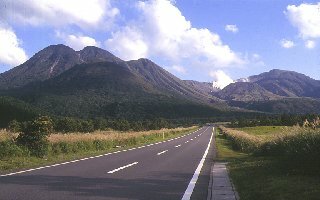 Kuju is located in a volcanic zone near Mt Aso. By using its rich earth heat, hot springs and earth heat power stations are exploited. The volcano which is fuming a white smoke at center is Mt. Iwo. Most recently it exploded in 1995. Yamanami Highway which links Yufuin and Aso is an agreeable drive way. You can admire there a magnificent landscape, rare in Japan especially the view of fuming Mt. Kuju from Choja-ga-hara is wonderful. The road has been constructed by Japanese Road Corporation and opened in 1964. At the start it was a toll road but a few years ago it became free.